This is the Infrared Organic Blend brought to you by Kickapoo Coffee Roasters. The Infrared Organic Blend features high quality coffees from Ethiopia and Colombia. This coffee is made for coffee drinkers looking for a little adventure. This blend works just as well as drip as it does as an espresso machine and it's a complex cup roasted a little deeper to highlight the exotic fruit notes and cacao nibs. Seems ok, I enjoy the beans. Easy to find a grind, nothing super exciting though. I'm not a huge fan of the fruit notes in this bean. Nice smooth flavor with mild/moderate tannic feel. This was a great bean. Funny name, serious flavor. Well-balanced and rich, but with enough fruitiness and bright acidity to mellow out the rich chocolate flavors. Definitely one I would get again. It's okay but too fruity for me. Tasted a little sour. Too strong as a cold brew. Might be good for pourover or french press. Not a bad coffee. I am just not a fan of the chocolate notes. Great crema, fresh. Not too strong. My first order. Plan try a bit stronger, more roasted version. Decent cup of coffee. A little too fruity for my taste. I have been enjoying the coffee, but would like to have something a little darker and intense. I detect more than anything else a fruity/dry quality that I like, but still prefer having the predominant taste be more dark and comforting. I put my preference between dark and medium because I think when the roast gets too dark it loses some interesting flavors. The predominant fruity/dry quality I mentioned is something I find in a lot of independent coffee shops with higher quality beans. But to me even though it's good, this quality makes them all taste similar. A lively and balanced cup. Cold brewed with my Toddy and enjoying all week. Strong fruity notes, some floral. Mildly acidic. Very smooth. Tasted more complex as it aged. 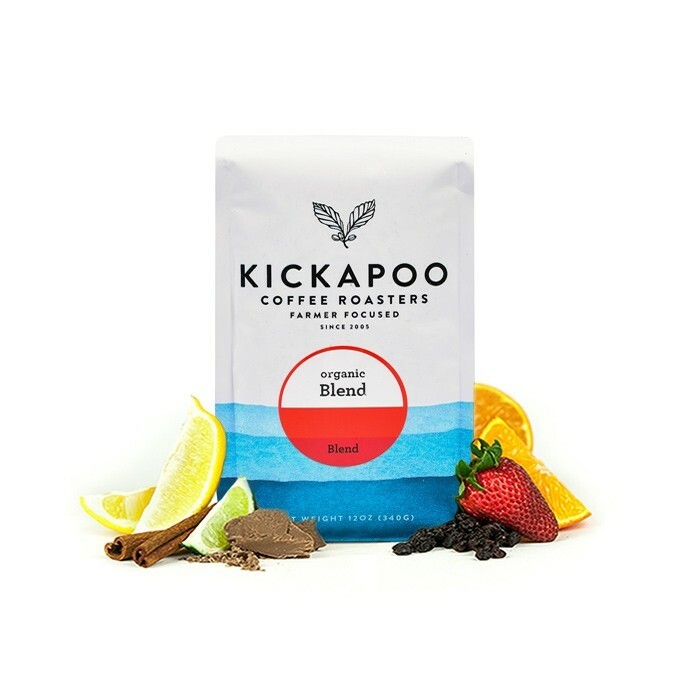 I enjoyed Kickapoo - nice "red wine-like" taste. However my wife found it a little to bitter for her taste. It made a decent cup of coffee, but nothing memorable. I liked it but it had a little bit of an acidic flavor to it. Good balance and body. Not a particularly dynamic flavor, but quite enjoyable. Really liked this coffee. Definitely rich and complex, made a great pour over and a pretty good french press. Decent cup of coffee. I would not call it complex. The fruity and chocolate notes did not come through for me, but that could be due to my inexperience and inability to pick them up. Based on the description of being "complex" and having "exotic" fruit notes, I expected more distinct flavor characteristics. I was underwhelmed, but consider this to be a decent balanced coffee. Really good. Light and flavorful. Could really taste the fruit notes. Brewing notes: used a medium-fine grind setting. Invert Aeropress with 17g coffee, fill with 50ml of 204 degree water, stir, set for 20s, fill to top, set for 1m, stir, flip and press. Really liked this one! Nice mouthfeel and definitely fruit-forward. Nothing really to note about this, it's drinkable but nothing stood out. Wonderful complex taste, but balanced, just the way I like it! I used a Moka Express pot to make a cappuccino, and it was perfect. Thank you Connor and Kickapoo Coffee! Delicious. Full bodied, rich, and flavorful. No bitterness. Love the complexity. Just made my first pot of Infrared on Technovorm Moccamaster - 24 gm to 450 ml water. It was light and delicious, and I cannot wait to brew a fuller pot on my Technivorm later. I like to sniff my coffee before I take a sip and this reminded me of jasmin flowers. As my tummy is sensitive to anything too acidic I typically don't take my coffee black, but I set aside a small espresso size cup without adding anything to it. It was smooth yet complex, fruity but not sour or too bright, and I definitely could drink this without my half-and-half - it's that good. Very clean and comforting brew.